Evening temperatures dip, football jerseys reappear on casual Fridays and #PSL is trending (again) — all signs of summer drawing to a close. Reflecting on Summer ‘18, as one does during times of transition, the word that percolates in my mind is metamorphosis (not just because I saw an E! News segment about Hilary Duff, I swear…). Our agency experienced major changes over the past 3 months, new ownership, new direction, new clients! The questions, who are we and where are we going, dominated our day-to-day. Perhaps this is why when we attended the MIMA series, Conversations About the Future of Advertising (CATFOA), we got so much out of it! At the helm of an agency shedding its cocoon, these conversations and connections could not have come at a better time. We laughed, networked, learned, jumped outside our comfort zone, and drank plenty of beer in the process. In the spirit of reflection we (I, Allison Wasz, and Jacklyn Heinlein…the Jobs to my Wasz) have tag-teamed this recap. It’s partly an effort to organize and summarize our own thoughts on the events, but, more importantly, it’s our desire to bring some amazing insights to a new audience and continue the conversation. 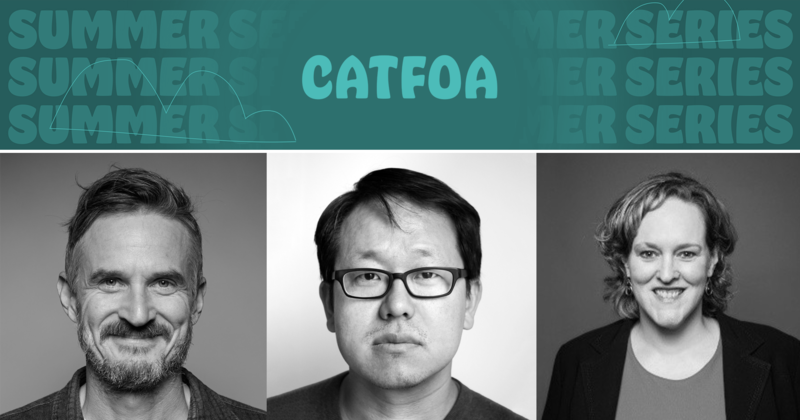 CATFOA didn’t start with a bang instead it was an f-bomb, several actually, brought to us by Jeff Kling. Unlike some people who wield four letter words mid-lecture for shock value or to appear hip, it seems that’s just how Jeff’s mind works. He’s unconventional, explosive and unfiltered leaving you with goosebumps. His raw creativity was palpable, and it makes sense as he was behind some of the greatest campaigns in modern marketing including Dos Equis’ “Most Interesting Man in the World”, Nike’s “Write the Future” campaign, and Arby’s “The Meats”, to name a few. AW: I don’t really have words for the way I felt leaving the conversation with Jeff, enamored with genius? Full-on fangirl? Shooketh? His thoughts regarding the role of marketing/advertising as agents of change for humanity… I picked my jaw up off the floor. It was more than a lightbulb, it was a f*cking celestial explosion. As marketers, it’s so easy to get caught up in selling on features and benefits and how great XYZ is but that’s not what consumers connect with. Regardless of whether you’re B2B or B2C, your potential customers are not robots they’re humans, and humans have emotions. To cut through the clutter of today’s marketplace and actually connect with consumers, your brand messaging must incorporate emotion, no matter who your audience is. An example he gave was REI deciding to close on Black Friday to make a statement that Thanksgiving and the day after should be spent with family, not shopping from dawn to dusk. This was risky, but it worked. They connected with their existing audience on a deeper level, gained the attention (and business) of new customers, and overall their annual revenue did not take a hit. Sung Chang is the CCO of MRM/McCann East, he’s taught at Miami Ad School, and he’s designed album covers for Wu-Tang Clan. Translation: Sung is very, very cool and very, very talented. Perhaps this is why it was so captivating when we spent more than half an hour chatting with him before the event. He listened to our small-agency woes and why we are proud to be a part of the Minneapolis creative community. It was obvious in conversation, and again in the interview, how creative Sung is. Though a different brand of creative from the last CATFOA, if Jeff was disruptive then Sung was strategic. He applies design thinking to business problems and the output is innovation. JH: Sung is what the youth would call “woke.” He was a fountain of wisdom, articulately spewing relatable but also extremely insightful nuggets one after the next, and I walked away with a renewed passion for creative agency life. In being creative, you’re sometimes going to fail and that’s okay! Because other times you’re going to create something that really knocks it out of the park. AW: One of the major things that resonated with me was Sung’s approach to culture. We have butted into this before, creativity demanded by our work requires vulnerability, and we often ask ourselves how can we build a company with a culture of vulnerability? Sung navigated the conversation from this place of ego-free leadership I found very inspiring. I got the feeling if you worked for this man he’d do everything in his power to build you up alongside him. Of all the people I’ve heard speak I did the most nodding during this interview and it was not just because of the beer! (Though it certainly didn’t hurt.) For me, this interview was the affirmation I didn’t know I needed. I’ve spent a lot of time recently in introspection, specifically around my role as a leader, am I doing it right? Am I making good decisions for my team? Is my intuition correct? The interview with Sung was the gut-check I desperately needed, I walked out with a full-heart and clear head for the first time in a long time. To recap the recap: if Jeff was disruptive and Sung was strategic, that makes Jen badass and forward-thinking. Jen is the kind of person you’d like to share a beer with after she helped you escape the Cartel using her extensive knowledge of Bitcoin and Blockchain. She is the Chief Customer Success Officer of Codelattice, citizen of the world, and our future best friend (hey, Jen!). JH: Jen took an intimidating topic and made it not only approachable, but relevant to our day-to-day lives as marketers and creatives. Jen is extremely well traveled and clearly incorporates that more global mindset into everything she does. While I didn’t necessarily walk away with new ideas for how to help our clients better capture the attention of their core audiences, I learned a lot about a topic I would have otherwise known hardly anything about. AW: Full-disclosure, words like Bitcoin or Blockchain elicit a Pavlovian reaction in me — my eyes glaze over and I immediately start thinking about dinner. Or, I should say, they used to. After Jen’s dumbed down explanation of Blockchain and CATFOA interview, I now feel comfortable using it in a sentence, that was an impressive feat. I know exactly how she did it too. No, it wasn’t more beer, it was through her travels. Her global perspective and anecdotes about applications of this technology to better the whole. My mind was blown. I got the feeling this may be Jen’s superpower: using storytelling to educate us, the masses of eager marketers, about the future benefits of sophisticated (and somewhat intimidating) tech like Blockchain and AI. She perfectly blended complicated technical concepts with human experience. Color me impressed. After Jen’s CATFOA interview I am committed to, “getting IT out of the basement” and stop siloing creativity to those with the word creative in their titles. Mini-shoutout to CATFOA host, Tim Brunelle! You always kept the conversation interesting and the nuggets of knowledge flowing. Agency Director Allison Wasz is a holistic thinker and digital marketing expert through and through. She lives and breathes digital — strategy, social media, paid search, user experience, and content generation are part of her day-to-day. Allison’s drive to understand the ‘why’ behind every action makes her well-suited to helping businesses of all sizes and across all industries develop and implement their digital marketing strategies. She believes in an educational approach to digital strategy, empowering clients to grasp how digital works in tandem with traditional marketing. Allison is a coffee drinker, part-time yogi, and red wine aficionado who spends her free time eating guacamole and patiently waiting for the next George R.R. Martin book. Jacklyn Heinlein is Macleod & Co.’s Creative & Strategic Director. With a degree in marketing from Saint Louis University, Jacklyn has learned just about every aspect of the marketing trade. She first taught herself the design discipline and worked for years as a graphic designer at a creative agency. An incredibly strategic thinker, she now applies herself to brand strategy, creative direction, web and SEO strategy, and content strategy. Jacklyn is also central to Macleod & Co.’s core operations, spearheading things like company profitability and efficiency, team management, and working in tandem with Allison to set the agency’s overall direction. No matter the project, Jacklyn makes it more creative, more strategic, and more successful. Outside the office, you can find her trying new restaurants with her husband and doting on her rescue dog, Dallas.